Releasing another lot of Franklin/Sterling Hill minerals from various collections but mostly the Phillips' Collection. This is a locality charished by those who not only enjoy rare species, but also fluorescent minerals. 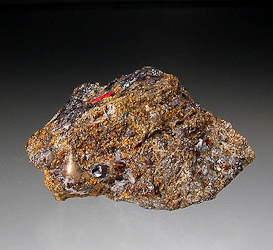 Feldspars are found in nearly every geological environment. We will have a nice group feldspars and feldspathoids which represents these diverse deposits. Somewhat kin to Franklin in terms of geology and mineralization, this area is also famous for its rare species. We will have some older material available. It's in short supply! 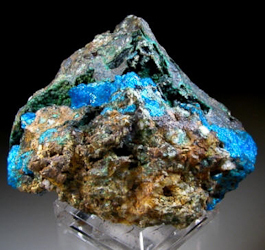 Rare Mineral Specimens from the Butte District in Montana. 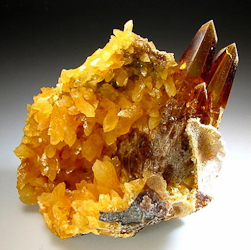 Read all about Butte mining history, geology and minerals. 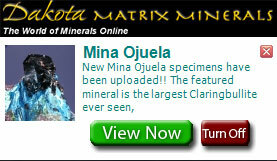 Dakota Matrix Special Editions are theme-based updates which concentrate on localities, mineral groups such as sulfosalts or phosphates, or type locality minerals for example. Actual examples of previously released Special Edition themes are shown below. Special Editions are released on a random schedule and are not announced in advance like the New Addition pages. You must download the exclusive Dakota Matrix Notifier to be informed when the Special Editions are released. The Notifier is a pop-up image, which utilizes .Net script. An example of the pop-up is shown below. The image will pop-up in the lower right corner of your screen when we release the Special Editions. It will continue to pop-up every 30 minutes for 72 hours. Detailed information and downloading or uninstall instructions can be found below. Click on the image below to Download. Once downloaded, a small icon will appear in the lower right corner of your screen. When Dakota Matrix publishes a Special Edition Update, the NOTIFIER (screen shot above) will pop-up in the lower right announcing the update. We developed this tool to give any customer the chance to be the first to view and purchase the mineral specimens on the Special Edition. We have been told many times that our New Additions, which are always announced ahead of time, sell too fast to buy. Now, the Notifier, will give you the competative edge and first shot at these minerals. This Notifier is designed to be as unobtrusive as possible. Dakota Matrix will never be “pushy” or annoying with no more than one or possibly two Special Edition notifications per week. You can UNINSTALL the Notifier anytime by going to your control panel and clicking on "Add/Remove programs" or other method in your control panel. The Dakota Matrix Notifier will allow you to receive notifications as soon as new products are released. The tool is NOT email based. A small window will pop-up in your lower right screen every 30 minutes. You have the option of turning off the Notifier by simply clicking the RED “Turn-Off” button. You can also right-click the tray icon and click View Messages to clear the history or see previous messages again. This tool works on Windows XP, Windows Vista, and Windows 7. The Notifier is not available for Mac/Apple users. To VIEW an update, click on "View" in the Notifier's box. The Dakota Matrix Notifier will be used for Special Edition & Random updates, Inventory Reductions or Sales. 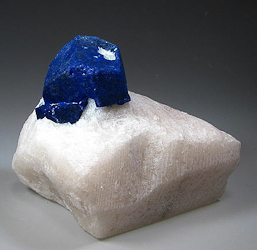 The Notifier will NOT be used for the Weekly 36 mineral updates (New Additions) or the Daily Five minerals. Please visit our home page for New Addition update times. We will always inform you on our first page when the Weekly-36 mineral updates will be published. But will not pre-post the date/time of Special Edition - random updates, specials, or sales. To TERMINATE the Notifier for the day, click on the RED “Turn Off” button on the Notifier for that specific update. (There may more than one notification occurring throughout the day). Once you reboot your computer, the Notifier will turn itself back on. You can turn on/off the Sound Byte. 2. Save the compressed .zip file to a location on your computer. 3. Open the .zip file and run (double click) DakotaMatrixInstaller.msi to install the software. 4. Restart your computer to activate. To uninstall, go to your control panel and click on "Add/Remove programs" follow the instructions on your screen. Thank you and enjoy using our new Notification Tool. Please contact Dakota Matrix for technical support at dmmcart@gmail.com .